Omaha's Henry Doorly Zoo and Aquarium expanded its cheetah breeding efforts with the recent addition of a four-acre, off-display facility located at Wildlife Safari Park. Wildlife Safari Park was chosen as the location of the new facility, as it allows more space for the Zoo's cheetahs to roam, gives them more privacy and provides and atmosphere that more closely resembles their natural habitat. The facility, which overlooks a field of hoofstock animals, is made up of two large barns: a 50 by 200-foot barn with seven 200 by 75-foot outdoor yards to hold breeding females and a 50 by 100-foot barn with two 200 by 200-foot outdoor yards for those females to rear their cubs. The barns are equipped with breezeways for easy access to the outdoors, skylights and privacy fences. The site also has five similar yards to hold the adult males, which are only brought up to the female barns to breed. A long path, referred to as "Lover's Lane" by Zoo staff, connect the male and female holding areas, so the males have an opportuniry to make a first impression on the females. The facility has taken the place of the Zoo's former Cheetah Valley, a two-acre exhibit featuring a 25 by 25-foot holding barn, a 15 by 12-foot cub-rearing barn and outdoor space furnished with heated indoor stalls. All of the Zoo's cheetah are now located at the new facility with the exception of two males, which will remain at the Zoo and live in the African Grasslands habitat. 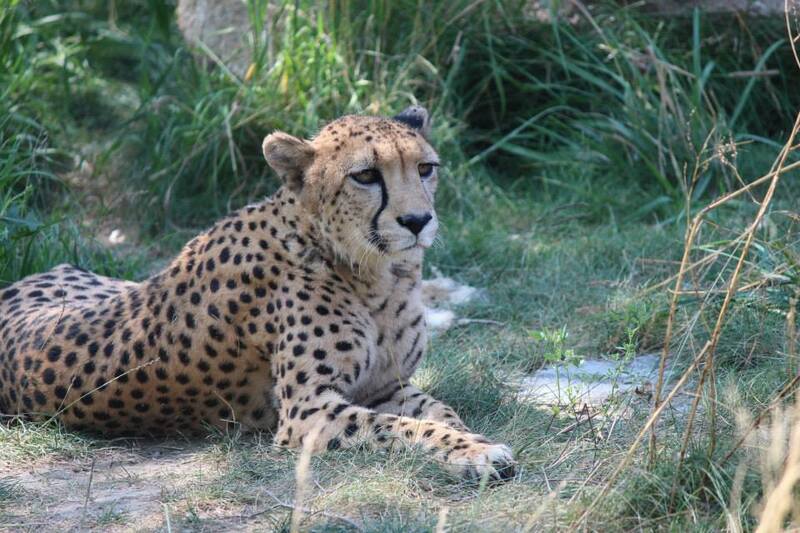 Omaha's Henry Doorly Zoo and Aquarium is one of nine Association of Zoos and Aquariums-accredited institutions that participate in the national cheetah Breeding Center Coalition. The other organizations are Fossil Rim Wildlife Center in Glen Rose, Texas; White Oak Conservation Center in Jacksonville, Florida; The Wilds and the Cincinnati Zoo in Ohio; the Smithsonian Conservation Biology Institute in Front Royal, Virginia; the St. Louis Zoo in St. Louis, Missouri; the Wildlife Safari in Winston, Oregon and San Diego Zoo Global in California. Working closely with the Cheetah Species Survival Plan, the BCC's goal is to create a sustainable cheetah population that will prevent extinction of the species, the world's fastest land mammals. Breeding the species can be a difficult and complex process for Zoo staff, as the large cats exhibit unique social and mating behaviors. While adult males live in social groups called coalitions, a group usually made up of brothers, adult females prefer to live solitary lifestyles and will only interact with other cheetah to breed and take care of their cubs. Adult females are very selective when it comes to choosing a mate. Cheetahs are listed as vulnerable on the International Union for Conservation of Nature's Red List of Threatened Species and are managed by a Species Survival Plan, a committee that makes breeding recommendations for all cheetah in North American zoos accredited by the Association of Zoos and Aquariums. Recommendations are made by pairing up genetically viable males and females within the population. Even under these circumstances, the adult females still have the final say as to who their mate will be. With only 12,000 to 15,000 cheetahs remaining in the wild, the Zoo and other coalition members are working closely to better understand and improve upon the husbandry, training, housing, research and overall management of the species to increase their breeding success.